A critical damage example: J2M2 destroying the engine modules of a bomber. “Gray log” of serious damage being inflicted: Here the oil tanks of the B-25 have been blown to pieces. If there are several active types of damage present on the vehicle - the first priority damage awards “aircraft destroyed” award, and the remainder receive assist if the damage inflicted by them occurs 30 seconds before its destruction (with the exception of a critical hit). Repairing an aircraft removes all active damage from it. In the case of players inflicting damage with equal priority and the enemy crashing - the destroyed aircraft is credited to the player who inflicted the damage last. In all cases listed below - a bail from the aircraft counts as an aircraft crash. Lethal damage – is damage which makes it impossible to restore an aircraft and return to the battle. Lethal damage will be allocated from the following; fuel explosion, tail structure being severed or a pilot's death. In some cases also when a wing is being sheared. If Lethal damage is inflicted, then the player causing it instantly gets an aircraft destroyed credit and all the rest of the players who damaged the enemy aircraft for the previous 30 seconds will receive an "assist". Removal of the wing tip (visually about one quarter) is not considered "Lethal damage". 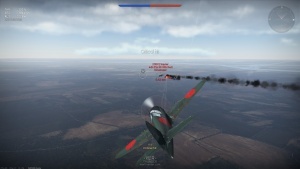 Wing removal in Arcade battles is always classed as "Lethal damage", except cases where the player is already on an airfield where repair is possible. In simulator and realistic battles it can be "Lethal damage", if the overall damage is too large to repair (about 50% of modules destroyed), and if an aircraft is landed without the ability to repair. Critical damage – a damage which may lead to it being impossible to successfully return to a friendly airfield for repair. Critical damage is a wing being taken off (except cases when it is lethal damage), destruction of control surfaces or the disabling of all engines. Critical damage is displayed in the damage log and grants a separate silver lion and research point award and may be inflicted to the aircraft only once per battle, excluding cases when all active damage is removed after a repair. Active Critical damage is applied to a target for 90 seconds. This means, if an aircraft has crashed while attempting to land during that time, the player who inflicted the critical hit will be awarded with aircraft destruction even if that player has disengaged from the enemy aircraft and the aircraft was under attack from other players. After 90 seconds have passed - the critical damage will stay with the target with a priority of a normal damage, hence it could be overridden by any other damage. This is the only damage type which grants assists after the 30 second time limit. Serious damage – is the destruction of one of the active engines while other engines are available or major wing damage without it being cut off. Serious damage is displayed on the side of the players display using gray text. A Player gains vehicle destruction from this damage only in if enemy aircraft has crashed and does not have active critical damage on it. At the same time it should be achieved while the timer is still in effect; 30 seconds in arcade battles, 60 seconds in realistic battles and 80 seconds in simulator battles. Normal damage – any hits that are not listed above. A player gains vehicle destruction from the damage only if the enemy aircraft has crashed and does not have active critical or serious damage on it. The timer that accounts for this is; 12 seconds for arcade and 15 seconds for both realistic and simulator battles. Fire damage – works in the same way as standard inflicted damage. While inflicting damage may cause any damage from normal to critical, which will be credited to player who has set the aircraft alight. 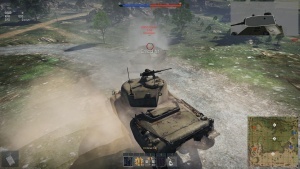 If there are several active types of damage present on the vehicle - the first priority damage awards a “ground unit destroyed” award, and the remainder receive an assist if the damage inflicted by them occurs 30 seconds before its destruction (with the exception of a critical hit). Tank repair does not repair ground vehicles completely - it only repairs until fighting capacity has been reached. 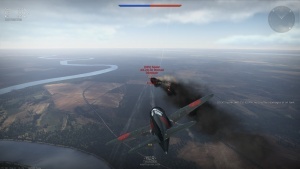 Thus repair does not remove damage from vehicles as it does in aircraft mode. Example of critical damage against a T-50 light tank. Like in Aviation scuttling the vehicle will give the kill credit to last player who damaged the vehicle substantially. Lethal damage – vehicles completely knocked out of battle. when all necessary equipment for combat has been destroyed. Lethal damage is caused by fuel explosion or ammo racking or disabling all the crew. While inflicting lethal damage a player will instantly receive credit for the ground force unit being destroyed and all the rest of the players who inflicted damage to that vehicle for the previous 30 seconds will get an assist. Critical damage – disabling two of the crew members. Critical damage is displayed in the damage log and grants a separate silver lion and research point award and may be inflicted to the vehicle only once per battle. If a vehicle is wrecked or the player leaves it - then the player who inflicted critical damage will get the ground unit destruction award even if, at the time player was disengaged from the enemy vehicle and it was under attack from other players. This is the only damage type which gives an assist after the 30 second timer has completed. Active fire – works on the same principle as standard inflicted damage. While inflicting damage may cause any damage from normal to critical, which will be credited to the player who set the vehicle on fire. While the vehicle is in flames - it will give a higher priority to receive credit for unit destruction than serious or normal damage. Serious damage – disabling one of the important modules - cannon or engine. A player gains vehicle destruction from this damage only if the enemy vehicle has been wrecked or the player has ejected and when it does not have active critical damage or fire associated with it. This should be no longer than 60 seconds. Normal damage – any module damage given. Hits without penetration or damage inflicted do not count as effective hits and will not be counted as normal damage either. A player gains vehicle destruction from this damage only if the enemy vehicle has been wrecked or the player has jumped out and when it does not have active critical or serious damage or fire associated with it. This should be no longer than 12 seconds. This page was last edited on 23 January 2019, at 18:36.